I've got an old 7-sp DuraAce triple that is in good shape mechanically but lacking aesthetically. It has a couple of wear spots through the anodizing and the logo is damaged on the diveside. The entire surface appears to have a haze in, not on, the surface. When I took a bit of regular mag wheel polish to them, the worn areas shined up nicely but the remainder still looks a bit milky. 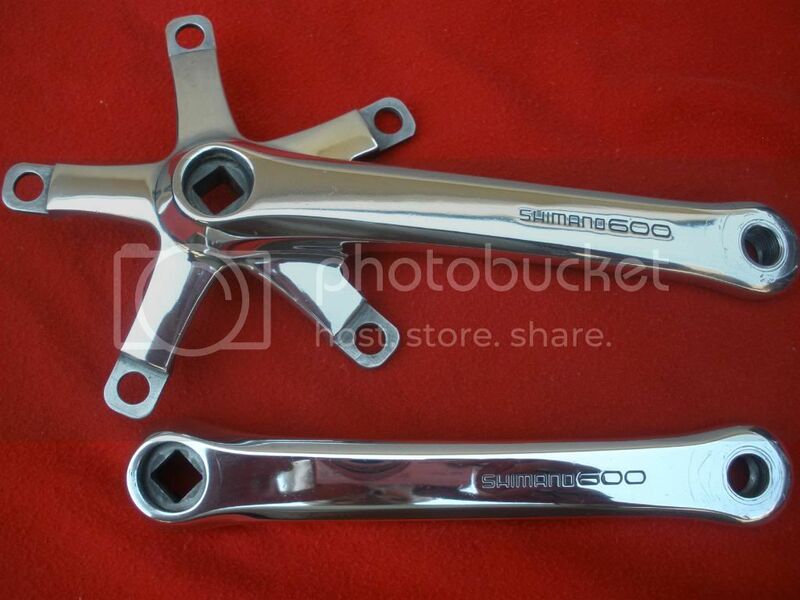 I want to use the crankset in a frankenbike project, so looks are secondary, but these look pretty bad. What would happen if I removed the entire surface and polished what was underneath? I'm sure it would polish up nicely but how would I keep it that way? Protectant? Frequent polishing? or is it just a bad idea? You can remove the layer of anodization using lye. Here's a writeup of the process. Be safe, use safety gear (especially goggles) and don't leave the cranks in the solution for any longer than necessary. Once you've removed the anodization, you'll need to polish the cranks, and occasionally wax them to prevent oxidization. That is exactly what I was looking for. Any advice on protecting the aluminum and keeping it shiny, or at least not corroded, after it has been stripped? I've done this a couple times. I used easyoff oven cleaner, then polished with Mothers aluminum polish. They stayed looking nice for a long time, just polish them every so often and they will stay nice. I think I'm going to try the lye bath. Randolph, how long of a soak are we talking about? I know it will vary but are we looking at minutes or hours? Is it something I need to check frequently or something that soaks a while on its own? I would try the oven cleaner first, it works pretty good and fast. The lye can damage the aluminum if you are not careful with your soak times. The active ingredient in oven cleaner is sodium hydroxide (lye) it also has other ingredients and from what I found in Randolph's link and elsewhere on the internet, it may actually have more potential to damage or discolor the aluminum, but I also found several reports of people using it successfully, so the risk looks about the same either way. Thanks for the input. ^ I thought I had recently read some threads regarding removing anodizing that recommended some newer products that did a good job. I had done a search but couldn't find them. Thanks for bringing one of these up (though I have never removed anodizing myself). I used to use oven cleaner to remove anodizing. One day I didn't have the patience to wait for it to do it's thing and sanded it off. Start with 200 grit wet, then move up to 600-1000-1500-2000. Finish off with Mothers aluminum polish. What good's a thread without a picture. This product is inexpensive and kicks a$$. After polishing with either paper or rouges, use this for the final shine. It leaves an invisible silicone film that helps protect the finish, very well, for a long time. 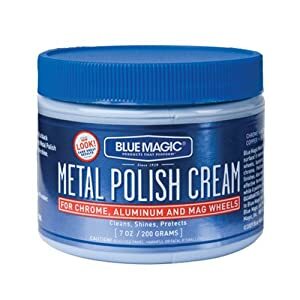 IMO this stuff works way better than Mothers, Semi Chrome, and all the other aluminum and "Mag" polishes. Works incredibly well on brass and copper too. The label says it's 100% abrasive free, but the stuff will even remove fine scratches. Just a great product. Last edited by SquidPuppet; 05-29-15 at 11:22 AM. To be clear, sodium hydroxide will attack aluminum - either with straight 100% lye, or with oven cleaner. Since people using oven cleaner have reported occasional pitting, possibly due to the other ingredients in the mix, I'd be more inclined to use plain lye. I used this on a stem for a BMX bike, and it was in the solution for less than 15 minutes. After 4-5 minutes I took it out every minute or so and checked on it. We need before, during, and after pics of your cranks! I didn't think to take a before picture, but I saw your post earlier after removing the anodizing. I did some hand sanding with progressively fine sandpaper and realized that there were just too many deeper scratches and, since this is for a Frankenbike project that doesn't have any other polished aluminum on it, I decided to go with a satin finish that would look similar to other aluminum on the bike. I used a media blaster with low air pressure and walnut hull media to get a flat and even finish, then polished with Meguiars Ultimate Compound on 0000 steel wool followed by Mothers Aluminum Polish to bring them to a bright satin finish. The scratches are still visible but don't stand out like a zit on the Mona Lisa. I think they'll fit the current character and finish of the bike quite well. Here they are after media blasting, with the non-drive crank polished, and finished ready for reassembly. Thanks for all the advice and links. I have used this method many times on anodized aluminum and it works great! A sponge ball on a drill for polishing with Mothers makes this an easy job. I know is has lye in it but it is no where near as strong as pure lye. I haven't had any problems using it in the past, and yes it will darken the aluminum but it will polish right off. I never let it sit and dry on what I am stripping and sometimes find I need another coat to remove all of it. Drain Cleaner also has lye in it and is stronger then Oven cleaner, I have used it to remove stuck stems in the past. 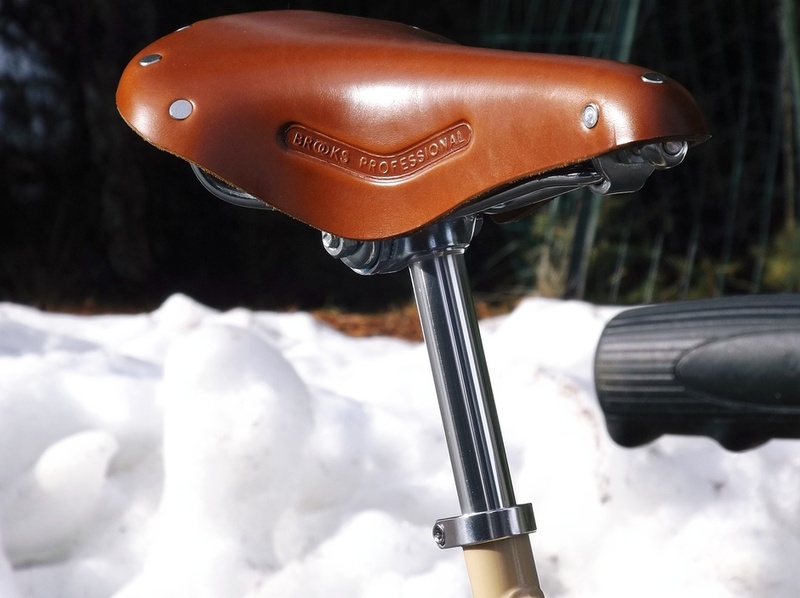 I am glad you got it the way you like using the blast cabinet, I have also used the finest glass bead in my cabinet on some cranks, stems & seat posts to get the dull gray effect. I have used oven cleaner- and then lye afterwords since I have found that is stronger on some of the rough spots. It worked great on some old cranks I got for free. Just be careful because the lye can ruin the finish if it is soaked for too long. If using oven cleaner, I have found if you warm the part it helps the cleaner work. You should be using protective gloves anyway, so a little heat is not going to bother you. The trick to avoiding damage is to not leave the cleaner on too long. My method is warm, spray, let sit five minutes, rinse and inspect. Repeat if necessary with a shorter sitting time. That link posted by Repechage is interesting. Looks like pretty good stuff. "16oz trigger bottle for $15.95 not $24.95 like others." …and then the price on the add to cart button is $18.95. we'll split the diff with ya.